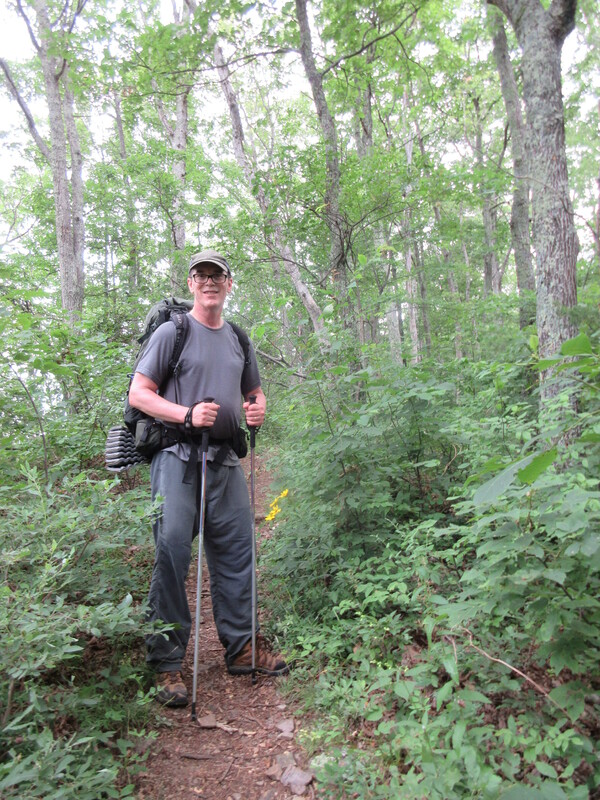 Birch and I have been itching to get back on the AT so we decided to do a repeat of our very first backpacking trip, but in the opposite direction. This gave me a real opportunity to reflect on how far we’ve come (both literally and figuratively) since I first put a backpack on less than four years ago. We started our day visiting Harpers Ferry and the Flip Flop Festival. My cousin, Lynn, works for the Appalachian Trail Conservancy and she was a great hostess. We were able to leave Gathland State Park and get on the trail by 11:30 am. The first part of the trail going north is a mild incline, but we haven’t been on the trail for a while so it felt pretty steep. I had forgotten just how beautiful the Maryland section is. It is relatively flat, but with enough hills to keep things interesting. There are rocks, but the trail is usually wide and smooth. There are no leaves on the trees yet so we had a chance to enjoy the sunshine. After about 7.5 miles we turned the corner to see Dahlgren Campground. For those who haven’t been there before but have spent time on the AT, this is a VERY unusual place. 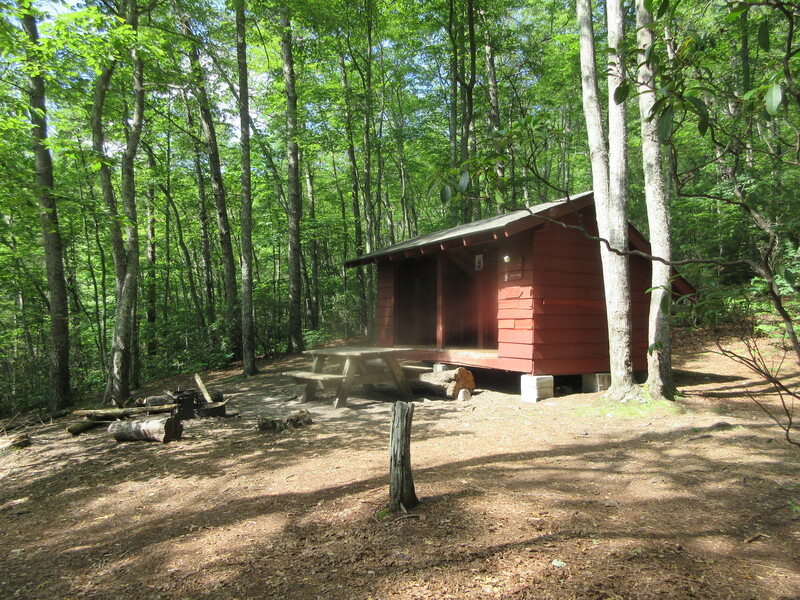 It has about 6 camp spots, each with its own picnic table and a tent platform. But the biggest deal is that there are regular bathrooms with running water and flush toilets. There is a large sink on the outside of the building to get water and wash dishes. I felt like we were cheating! As with most of our hikes, the best part was meeting interesting people. Camping near us was a man named “Vinegar” who was retired and had section hiked the trail from Georgia to Maryland. His goal was to get to the Hudson River. Vinegar’s personality was anything but sour. He might continue on the trail and there is a slight chance that we’ll meet him again along the way. I hope so. Dahlgren had two sets of newly started flip floppers. Among them were a father-son team who had never backpacked before. This was their first night on the trail. I must say, it really reminded me of our first hike to Dahlgren. We had so many questions back then, and had so much to learn. Even little things, like figuring out how to use the bear pole. After dinner it began to rain, as forecasted. However, we had one super power that made this all right. A new tent! The REI Half Dome 2+ is huge. It has a big vestibule that made it possible to keep our backpack and other gear outside. It kept us nice and dry. The temperatures dropped considerably overnight and we were thankful to have our down jacket to put on in the morning. After a delicious cup of coffee and a not-so-delicious bowl of oatmeal (I forgot the sugar) we packed up and were on our way. We passed the church and took a picture of Birch at the same spot we took a photo on our first backpack trip. We stopped by Washington Monument and then descended. On this trip, we noticed that there were a lot of freshly cut trees. Someone had done a lot of work to keep the trail clean. Overall, we had a fabulous time. Being on the trail never gets old. Birch and I were eager to get back on the trail this Fourth of July weekend. We drove down from our home in Maryland – a 5 hour drive! Bubba shuttled us to our starting point at VA-606 and we were on the trail by 12:30 pm. This might be one of our latest starts but we had a very short 6+ mile hike to the shelter. The hike began near Kimberling Creek, where we crossed a wobbly suspension bridge. At the other end we met a couple of backpackers who were hiking north. They were able to assure us that water was flowing at Jenny Knob Shelter. At this time of year you never know, so it was great news. It was a hot, sticky day and it felt like we were in a rain forest. The trail winds around ravines and slowing ascends up to a ridge and Brushy Mountain. We hiked beside a stream that is listed as “unreliable” in the AWOL guide and that was a pretty good description. It was barely flowing. It wasn’t long before we reached the shelter. We were a little surprised to find that we had it all to ourselves. Before long “Wolfgang”, a long section hiker from Germany, joined us. Wolfgang planned to hike from Georgia to New Jersey. He was about our age and was very philosophical about what hiking the trail really meant to him. We enjoyed his company. By 7:30 am the next day we had completed breakfast, packed our tent, and were on the trail. Although the guide books make the hike look pretty flat it certainly didn’t feel that way. We seemed to be doing a lot more “up” than “down”! The ridge line was beautiful. As we approached Helveys Mill Shelter the woods switched from oaks and birch to pines. 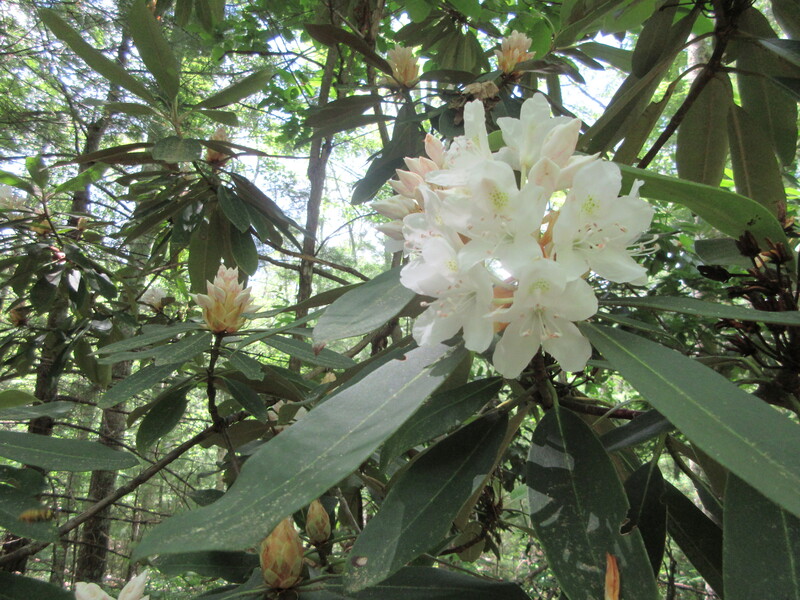 There were beautiful blooming rhododendrons too. The trail itself was very smooth and it was a pleasure to be able to look ahead and not have to watch our feet. The only thing missing was…people. What a difference it makes to be out of the thru hiker bubble! Several miles into our hike a woman named “Maps” approached us going north and remarked that we were the only people she had seen all day. Likewise! 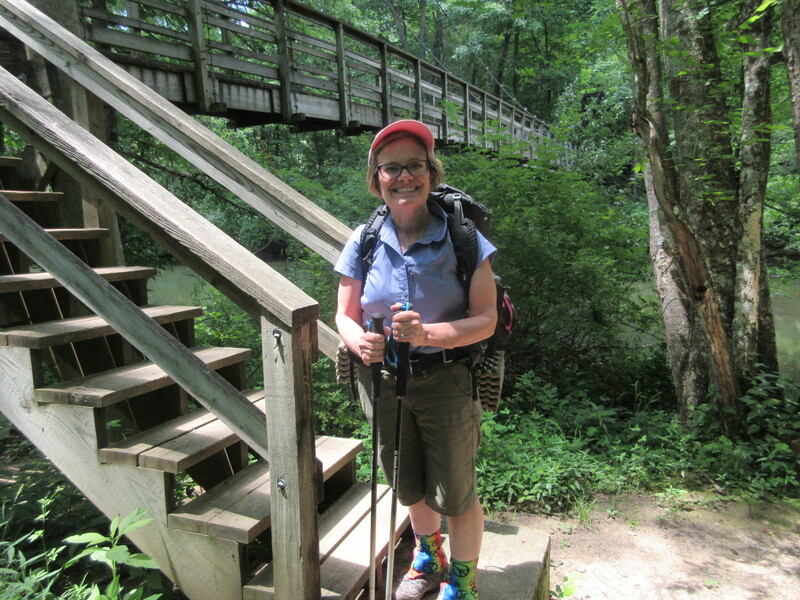 “Maps” is a section hiker who has completed a lot of the trail. She was really impressive. What the heck is this?!?! Let us know.